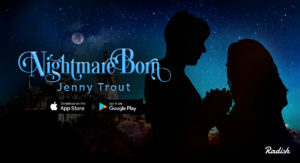 Previous Post NIGHTMARE BORN trailer! I feel you. I had two of my wisdom teeth extracted yesterday, and today I am cooling my cheek like a champ so I don’t look like an inflated hamster…. Loving your shirt! I love Caitlin Doughty’s books just as much as yours (because I don’t have it in me to choose). Off-topic: Jenny, your hair looks really nice! I was thinking about that in the drunk tarot video! Her hair looked really pretty. The grass is always greener, I know, but I love the curls. Awesome video, creepy story. Difficult question though…I know it’s not your obligation or anything but did you suggest to whomever ended up with the cursed house that they might want to have it cleansed? Knowing what you do of what happened, it couldn’t hurt to have recommended it. I really shouldn’t watch that video last night, when already in bed. It spooked me. Ahhh Cathy, the curse that keeps on giving. I also just discovered Harmony Nice while looking for decent witch content. Who was the other person you mentioned? This story never fails to creep me out. I’m so glad you got out of that situation, with your family, all safe. Good riddance to that hateful being, seriously. Jen, why do you look like you’re about 25 years old? You look great in the video! And I loved hearing you tell the Cathy story even though I had already read the series and knew what going to happen. The Christmas ornament was a new detail, though. I’ve been reading your other, witchy blog, too and I really like it. I’m going to look up your YouTube channel. Is that where you do drunk tarot on Saturday nights?